Which Kneepad should I choose? Jobman Workwear is a world leader in Knee Protector design. We have a range of protection available to your knees depending on how many hours per day you find yourself on your knees in your job. Knee pads are an important part of your work gear. Having them insertable into your pants makes it easy for you to keep up with during the day. Just insert them one time and you are good for the whole day. 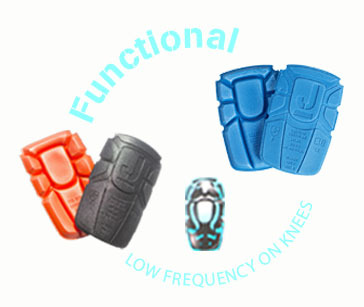 We now have 5 options for you in kneepads. The first level is for the person who just occasionally kneels down during the course of their day. And we have insert knee protectors for the professional, such as a floor layer specialist that spends the majority of their day on their knees. Please note that kneepads in your knee pad pockets, will feel awkward at first and may even irritate your knees somewhat until you get used to them being there. After several days, you will begin to feel awkward when you find yourself without them in place. Give yourself a few days to get used to using your kneepads. Also, note that the higher you go in knee protection, the more it will take to get used to them, as the higher protection kneepads are more less soft, as they have to protect your knees longer. Soft kneepads feel nice initially, but as you go through the day, you will find the higher protector kneepads will give you much better protection all day long. These kneepads will fit in brands other than JOBMAN Workwear. So, no matter what brand of workwear you choose to wear, you can still order and fit these knee protectors in your pants. Note that these are a tight fit in the JOBMAN Workwear kneepad pockets - that is a good thing as you don't want them moving around on you. Just cup them to get them in, if they feel tight in the pockets going in. Just get them in and tucked into the lower pocket and they will stay in place all day long. We also have a video available to show how these are fitted into JOBMAN Workwear workpants. Lightweight, soft, and very flexible. Pre-bent for a comfortable fit. Designed for occasional kneeling and are very flexible and comfortable even when walking or sitting. Flexible with medium compression and rubber shell which distributes your weight while working on your knees. Prebent to fit knees comfortably. Firmer protection for frequent work kneeling down.